The human body was not designed to sit for extended periods of time, so the very nature of desk work often results in chronic health problems. In fact, one study performed by the American College of Cardiology even suggests that sitting for extended periods of time is more harmful than smoking. Anyone who is required to sit at their desk for hours on end can certainly attest to the damaging effects it has on their physical and mental well-being. While getting up from time to time is part of the solution, others are also investing in re-configuring their workstation or switching to a standing workstation that significantly improves posture and blood flow. On the other hand, people who prefer to sit in their office should make sure that they are following the proper position recommendations to reduce the probability of suffering from long-term conditions like arthritis, neck pain, or back pain. Often, setting up a workstation so it can be easily adjusted from sitting to standing is one of the best options, assuming that proper posture is followed. Then, quickly switch back-and-forth between the two in order to stretch out the legs and sit down for a little bit to give the legs a break. In either case, it’s all about positioning so let’s go over the proper posture for both a sitting and standing workstation. When setting up your sitting workstation, it all comes down to utilizing the proper angles to avoid chronic health problems. First, set your chair at the correct height and pretend like you are playing the piano. 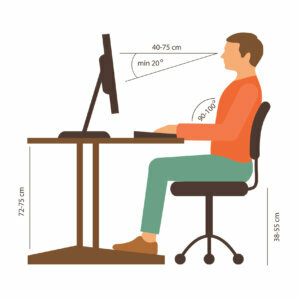 Then adjust the desk, screen, keyboard, and everything else around this position. The goal is to design your workstation around you, rather than having your body adjust to your workstation. Your screen should be an arm’s distance away and at eye level. The desk and keyboard should be set up, so the elbows make a 90 to 100° angle. Then, the chair should be set up so one can comfortably sit back, yet retain an upright angle. This position should be maintained throughout the workday so if you find yourself slouching; it is best to take a little break and come back when rested. Sitting improperly causes damage to the vertebral discs, weakens important muscles, tightens other muscles, and strains ligaments and joints. It is important to purchase a high-quality chair that is the proper size and avoid sitting for extended periods of time. Consider a chair that has breathable fabric with 2 inches of padding provides support to the back, is durable, has a five-leg base, and is fully adjustable, allowing for customization. When adjusting the chair to the proper position, find a comfortable position by adjusting the seat tilt, so there isn’t much pressure on the back of the thighs. Now sit up straight and adjust the back of the chair in order to sit in a slightly arched back position that is comfortable. This position should be the epitome of perfect posture. The key is maintaining this position throughout working hours. The challenges of maintaining this position may be difficult at first, as many people are used to slouching over and don’t have an awareness of what constitutes proper posture. However, posture problems contribute to chronic health issues, making it essential to focus on the correct sitting position until it becomes an ingrained part of your work habits. A standing workstation is growing in popularity; people who set up their office in this fashion notice an improvement in their overall posture and often find that chronic problems are diminished by standing in front of the computer, rather than sitting. Again, setting up a standing workstation should begin with you, while adjusting your desk around your needs. Ideally, the elbows should be at the same angle as when sitting, between 90° and 100°. At that point, measure the height that allows this elbow angle and adjust or create a standing workstation accordingly. As with the sitting workstation, the monitor should remain at about an arm’s length away and be placed directly in line with the eyes to avoid slouching over. Ideally, be certain to maintain proper posture and focus on keeping the spinal column in alignment. Then, stand with a gentle bend in the knees and give this new Workstation a try. This position may take a while to get used to, as the muscles in the lower back have often been weakened from years of sitting. However, this muscle pain is only temporary, as these muscles regain their strength. Some people also customize their standing workstation with an anti-fatigue mat to limit leg and foot pain that eventually sets in from long periods of standing. Ideally, look for an anti-fatigue mat that has a no-slip surface and a sealed bottom. In most cases, this mat should be between 5/8 and 3/4 inch thick. People who want to experiment with the standing workstation don’t have to initially invest in an overly expensive desk but can customize their workstation using a variety of materials, as long as it meets proper posture requirements. Ideally, set up the mouse as close to the keyboard as possible. When using a mouse, the elbow should be at a 90° angle, while focusing on moving the mouse with the shoulder, rather than the wrist to avoid wrist pain. Also, use the scroll ball as much as possible instead of moving the mouse continuously. Individuals who are already dealing with repetitive motion injuries sometimes use a foot operated mouse. 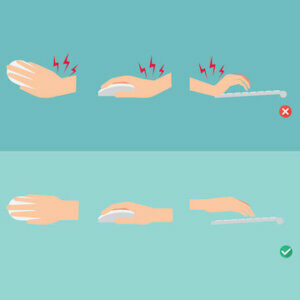 Setting up the proper keyboard position can make a huge difference for people who are suffering from wrist problems. Ideally, ensure that the hands are in a neutral position on the keyboard and that the fingers can rest comfortably on the Q to P keys row, so there is no strain when typing. When setting up the keyboard, consider an adjustable arm keyboard with platform, as they can move into any customizable position. Another option is the under mounted desk keyboard tray which is less expensive and is likely to be sufficient if it is set at the correct height. If using a laptop, consider purchasing an external monitor, keyboard, and mouse to set up the proper workstation. Many people forget about the eye strain that comes from staring at the monitor for extended periods of time. To avoid eye problems, it is advised to look away from the screen every 20 minutes, ideally at something 20 feet away and stare at it for 20 seconds. How Much More Time Can I Work With The Standing Workstation? Well, this depends on each individual, but the general recommendation for time spent at a standing workstation is between 60 and 90 minutes at once. On the other hand, it is best to avoid sitting for over 30 minutes at a time. People who can switch back-and-forth between a standing and sitting workstation may be able to maximize their time spent working while avoiding chronic problems that result from sitting or standing too much. Most people, especially those on a budget, may stick to a fixed height desk, in many cases, one that they have personally modified. If this works, it is just as effective as any of the expensive standing workstations. 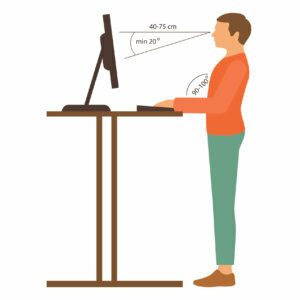 However, individuals who want to switch between working in a sitting and standing position or who share a desk may want to purchase an adjustable height desk to quickly move between the two positions. The best options here are ones that have a motor for easy height adjustments and a memory option so that the correct positions can be programmed in. One of the best options on the market is the Varidesk Plus. Taking regular breaks to perform stretching exercises is a good idea for people who work long hours at their desk. Specifically, stretching the back, legs, neck, and shoulders is a good way of maintaining health while working. Taking breaks is important and should be performed on a set schedule. Many people set the alarm or use an app so they don’t forget to take breaks when needed. For those who are sitting at their desk, consider taking at least a two-minute break after 30 minutes, a 5-minute break after an hour, and a 15-minute break after two hours of work. Don’t Overdo It – Life Isn’t All About Work! The key with any workstation is to avoid chronic injuries that are often attributed to overwork. Ideally, take breaks when needed, sleep at least 6 to 8 hours a night, and focus on the good things in life instead of working all the time. The nice thing about setting up the proper standing or sitting workstation is that it is individually customized to your needs, maximizing your productivity, and limiting chronic injuries related to repetitive strain.